With the Note 7, Samsung is taking yet another iterative step forward with one of its core devices. 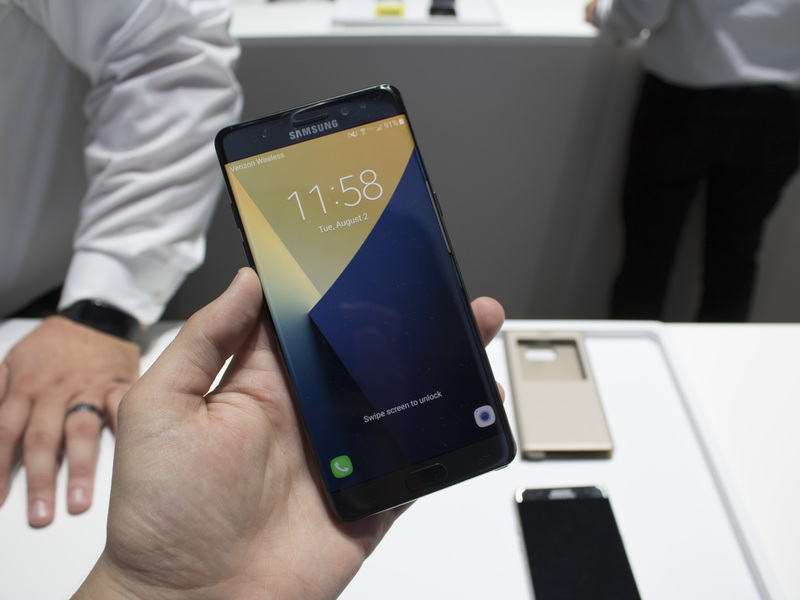 Despite skipping a number to facilitate a cohesive naming scheme across its lineup of flagship devices, the company has taken much of what made the S7 and S7 Edge such a refined device, and applied it to the Note 7’s slightly larger 5.7-inch form factor. After going hands-on with the Note 7 for a dozen minutes at Samsung’s recent Unpacked event in New York, I walked away impressed with the device, though the Note 7 is still a minor jump over the Note 5. Despite the S Pen feeling more responsive, moving to 4,096 levels of pressure sensitivity, compared to 2,048, I’m still unlikely to actually use it. 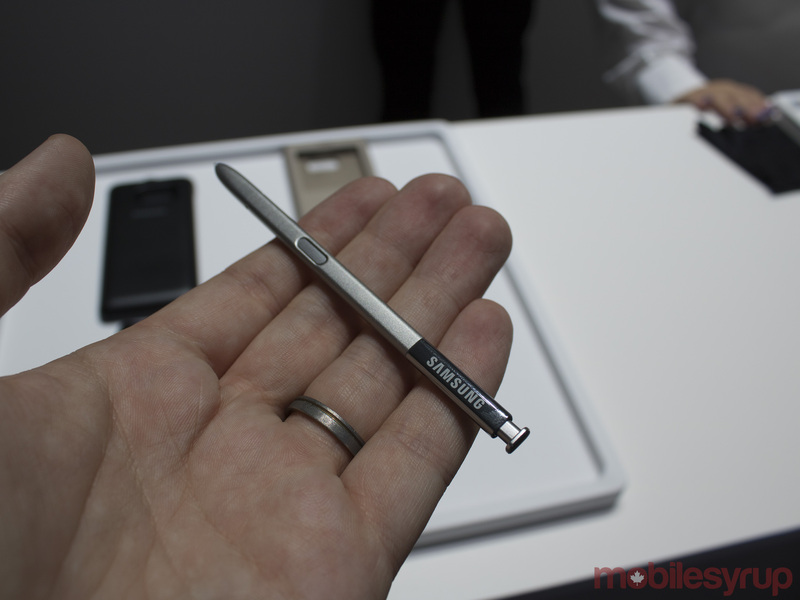 I find little use for a stylus when performing day-to-day tasks on a phablet device, so I assume I’ll feel the same about the Note 7, just as I did during my time with the Note 5. It is, however, worth pointing out that the S Pen does feature quick text translation, a magnifying loupe for those who prefer larger text, and the ability to easily create GIFs from any video running on your phone. The GIF creation process is simple and works similarly to other Android GIF creator apps. Overall, it doesn’t hurt to have the S Pen available at the odd chance that I’d actually want to use it, however unlikely that may be. 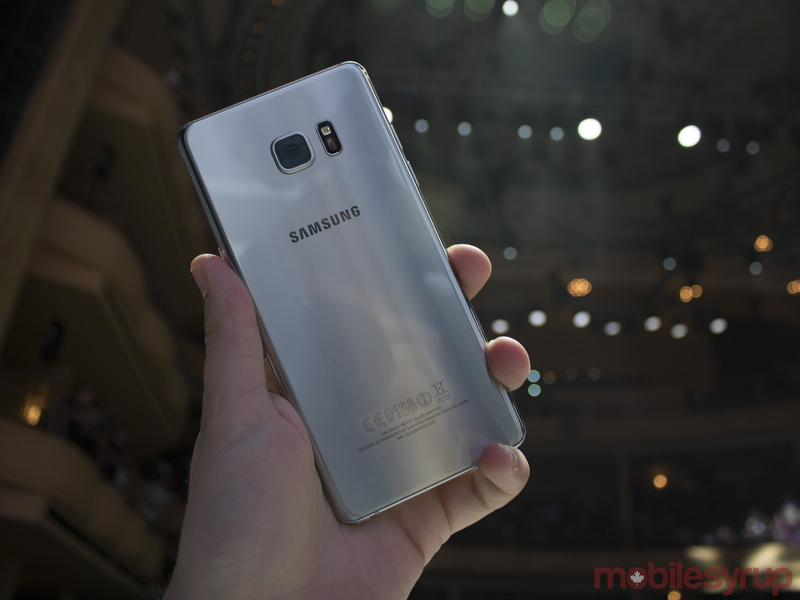 In terms of specs, the Note 7 is a powerhouse, packing a Snapdragon 820 processor in Canada and the U.S. 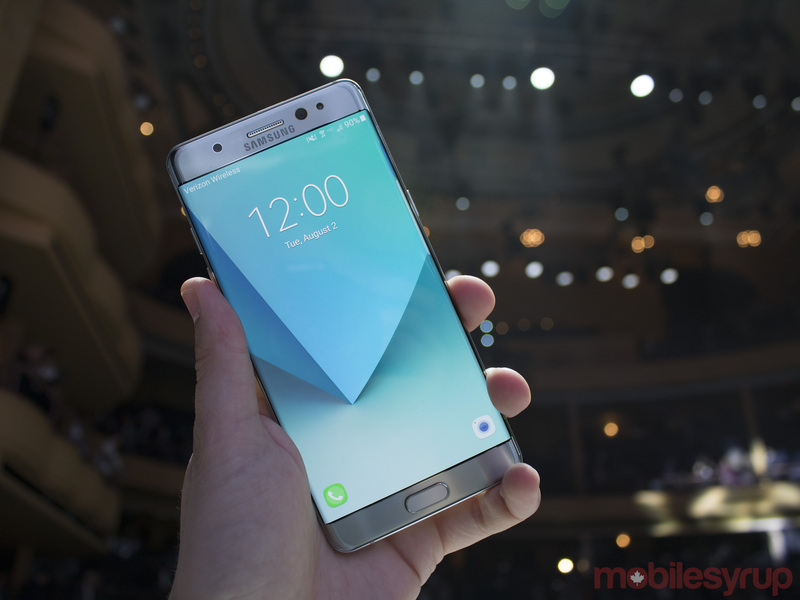 It seems predictions indicating the Note 7 would feature new silicon were inaccurate. It looks like Samsung is saving the horsepower upgrade for the inevitable S8. The Note 7 is IP68 water resistant, as is the included S Pen, giving it an advantage over the Note 5 in that respect. The phone also rocks 4GB of RAM, features wireless quick charging and the same 12 megapixel front-facing camera featuring an f/1.7 lens and optical image stabilization. The dual-pixel technology that made the S7’s back camera such a great shooter is also present in the Note 7. While I only tested the camera a few times on the press conference show floor, it seems to perform identically to the S7 and S7 Edge. 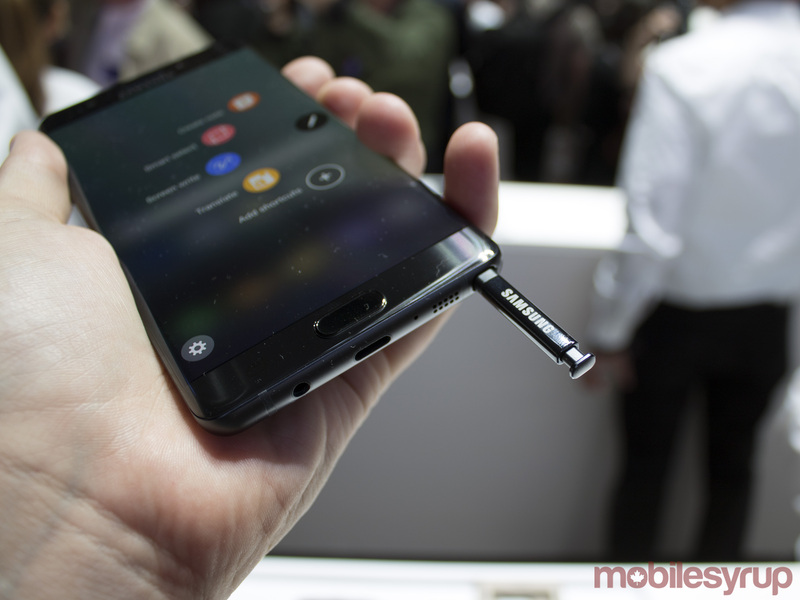 Furthermore the Note 7 adds microSD card support, another feature that wasn’t found on the Note 5 but did find its way into the S7 and S7 Edge. It also rocks a larger battery, measuring in at 3,500mAh, a substantial increase over the Note 5’s 3,000mAh power source. Other similarities shared with the S7 Edge include a dual-curved Super AMOLED display with a quad HD 2560 x 1440 pixel resolution. 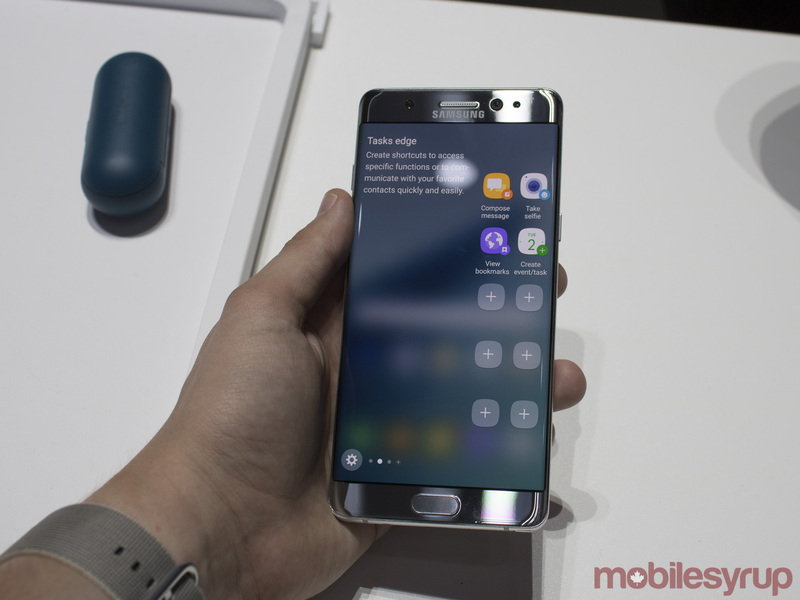 Where the Note 7 differs in terms of its screen is that it’s slightly larger, coming in at 5.7-inches. The screen’s curve is less drastic than the S7 Edge and also features high dynamic (HDR) range, which Samsung says will result in improved display quality in terms of colour, though in my brief period of time with the phone, I didn’t notice a significant difference. 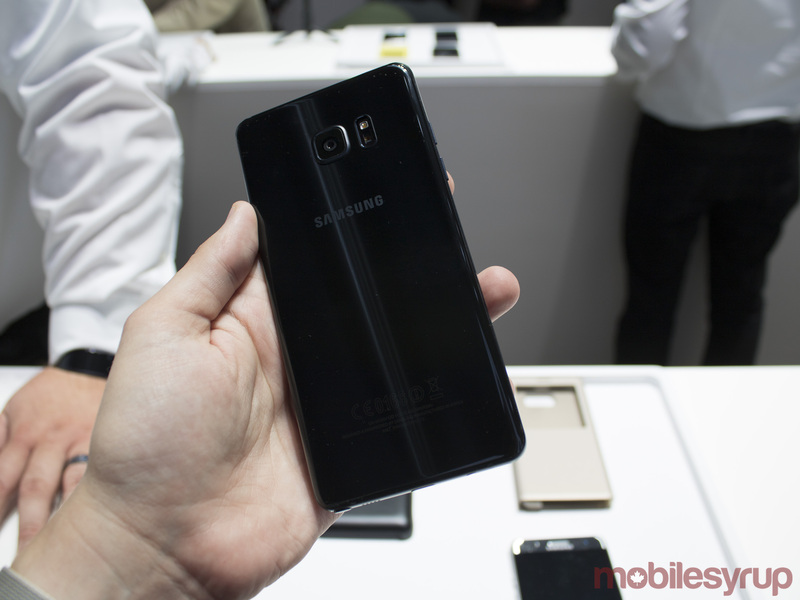 It also includes Corning’s new Gorilla Glass 5 solution. 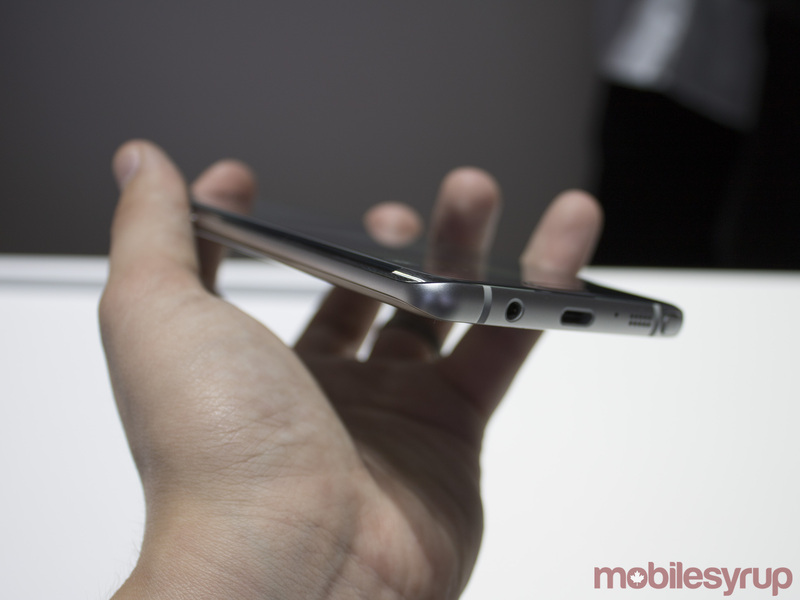 According to Samsung, the Note 7 is 2.2mm thinner than its predecessor thanks to its curved display. Given its curved glass features double edges, I was also pleased to find that the Note 7 fits great in just one hand, something I didn’t find to be true with past Note devices. 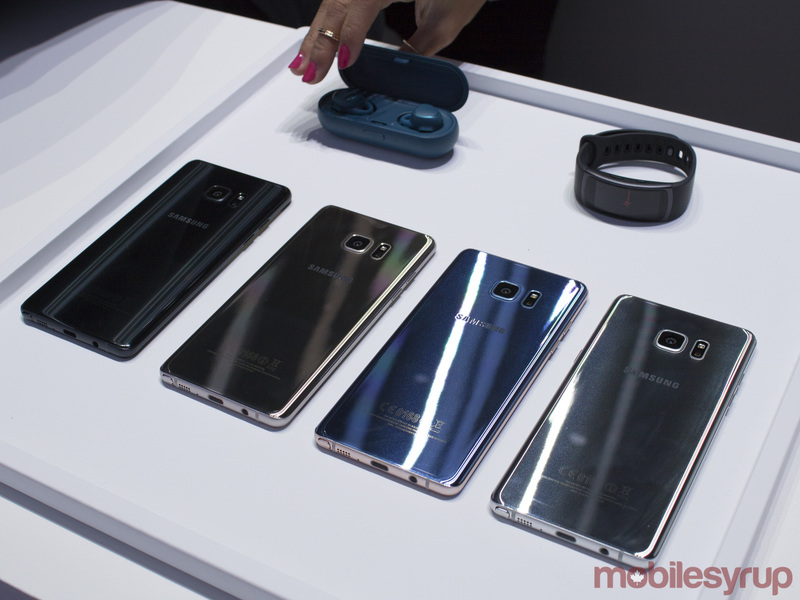 This is, however, the first Samsung device to utilize USB Type-C charging, though the Note 7 does include an adapter that allows it to work with existing microUSB chargers. 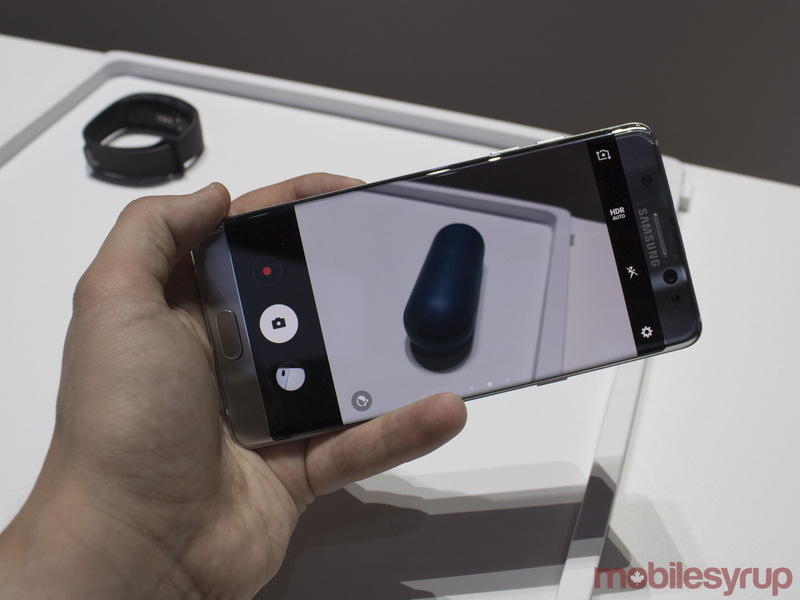 The phone also features a very interesting iris scanner that could change the way we log into our devices. Unfortunately, while I did watch a demonstration of the Note 7’s iris scanner in action, I wasn’t able to test it myself. The feature seems very similar to Microsoft’s Windows Hello, one of the best parts of the Lumia 950, though I’ll need to actually go hands-on with it before passing final judgment. In many ways, the Note 7 is little more than a larger S7 Edge, though given what a superlative device the S7 edge is, this isn’t a bad thing. Overall, the Note 7 is a visually impressive device and refinement of the Note 5 that includes all the best features from the S7. 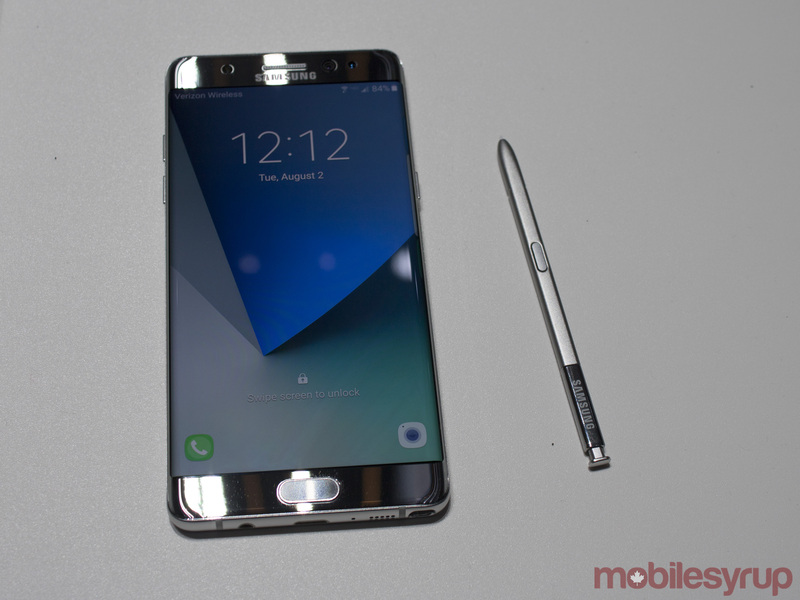 The Note 7 is set to sell in Canada for $1049.99 off contract and $549.99 on a two-year contract. 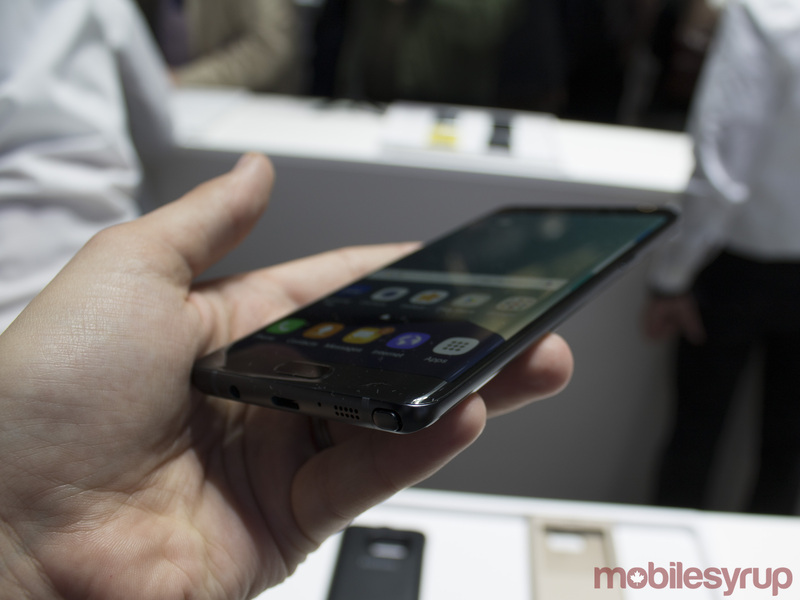 So far we have been able to confirm that Bell, Telus and Koodo will release the Note 7 in Canada.